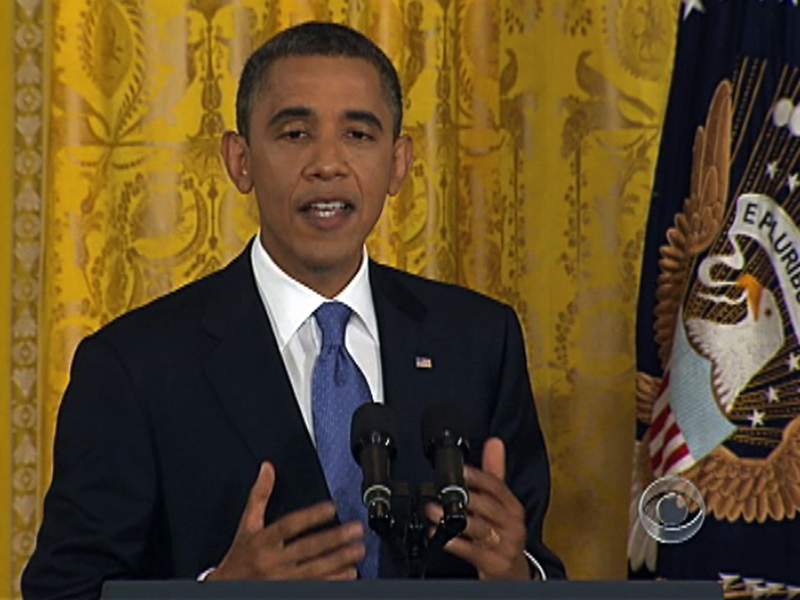 President Obama held a news conference to put pressure on Congress to pass the American Jobs Act. But, some believe that he's campaigning against a do-nothing Congress instead of negotiating. Bill Plante speaks with Mr. Obama about his motivations. President Obama "has suffered the most unrelentingly negative treatment" of all presidential candidates over the past five months, according to a study released Monday from the Pew Research Center's Project for Excellence in Journalism. Pew found that Mr. Obama was the subject of negative assessments nearly four times as often as he was the subject of positive assessments. It found he received "positive" coverage nine percent of the time, "neutral" coverage 57 percent of the time and "negative" coverage 34 percent of the time. The study, which was conducted using a combination of "traditional media research methods [and] computer algorithms to track the level and tone of coverage," cuts against the widespread conservative claim that the "liberal media" aides Mr. Obama and other Democrats while attacking Republicans. Mr. Obama's negative coverage could be explained in part by the fact that he is "covered largely as president rather than a candidate," Pew said - and coverage of him is linked to the struggling economy. Perry had the best ratio of any candidate, with 32 percent positive coverage to 20 percent negative coverage, a 12 percent net positive ratings in terms of coverage. He was followed by Palin (with 9 percent net positive coverage), Bachmann (8 percent net positive), Cain (5 percent net positive), Ron Paul and Jon Huntsman (both with 4 percent net positive coverage.) Pew found that Cain surged in positive coverage starting in late August - even before he did so in the polls. The only candidate who received more negative coverage than Mr. Obama was Newt Gingrich, whom Pew found was the subject of negative coverage 35 percent of the time. That can be attrubited in part to his early stumbles, including his criticism of the House GOP Medicare plan and the decision by top staffers to abandom Gingrich's campaign. While Pew found that Mr. Obama received just nine percent positive coverage, however, Gingrich received 15 percent positive coverage. As Politico's Keach Hagey notes, Pew found that Mr. Obama had widely positive media coverage during his first 100 days in office, with 42 percent positive coverage and 20 percent negative coverage. To assess the tone of coverage, PEJ researchers then employed computer algorithmic software from Crimson Hexagon. Researchers conducted a tone analysis and then "trained" the algorithm to follow the same rules as they had themselves. PEJ also conducted inter-coder tests to ensure the computer coding was replicable and valid by comparing human coding to the results derived by the algorithm. The project also had different people build the algorithms separately to ensure that they were achieving consistent results. Each computer algorithm was then additionally tested for reliability by having multiple researchers review the content assessed and the results.